To make the latest technologies work for you is what we aim for while working towards delivering web design projects using state-of-the-art techniques, to enhance your online presence. Webmekanics offers unique yet professional web design and web development services at the best possible rates, with a guarantee that you won’t find a better result within the same category. We not only work towards redesigning your website, but aim to refresh your identity completely in a bid to make your business appeal higher number of clients. 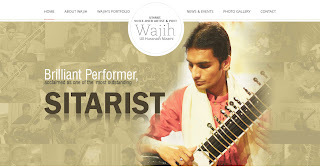 In one of our recent web design projects, we have applied the same philosophy and provided Mr. Wajih Ull Hussnain Nizami with a unique single-page web design that not only serves his purpose of projecting himself as one of the youngest Sitarists in Pakistan, a Voice-Over Artist, and a Poet but also attracts more people of the same domain like and follow his work. Webmekanics feel really proud to play their part as a web design company for young, talented, and energetic artists like Wajih Ull Hussnain Nizami, rise to higher levels of popularity and success.